Helloooo .... from a very cold and rainy NZ! 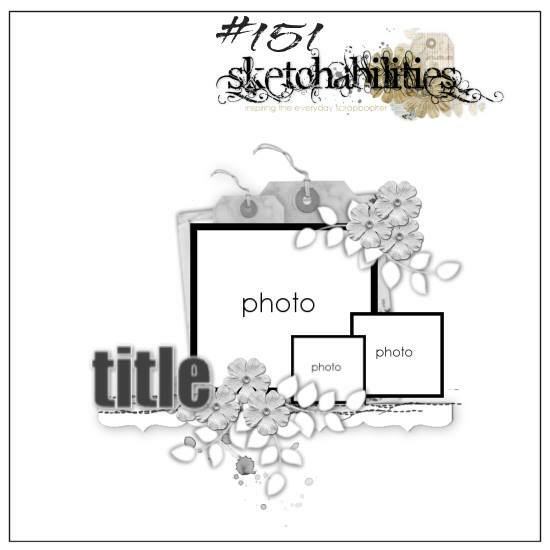 I so enjoyed all the lovely layouts from everyone who joined Sketchabilities with their comeback reveal #150 - I love how one sketch can produce such varieties and beautiful interpretations - amazing! Here I have lightly brushed the paper with gesso and then stamped the paper with black ink and a script stamp. I then splattered some brownish/reddish ink on the page. Once dry, I gesso'd over this lightly again, and once all dry, I sandpapered over the page and then stamped on the black inch blots. I also inked the edge of the paper with a brown ink. 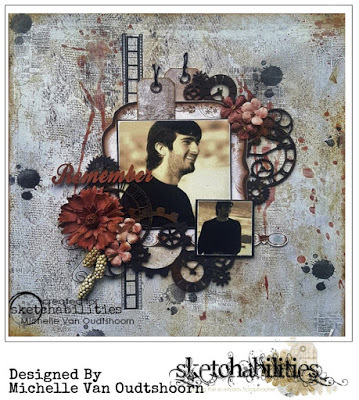 The layout is finished off with a layering of paper, tags and the chipboard cogs and 49 and Market flowers. Looking a little closer, shows the stamping in the background and the inking. The cogs have been panted in black and then dabbed with copper, bronze and gold paint to give it that rusty look. The matting for the photo is an old Bo Bunny collection that I cut out and distressed. I stamped a film strip image and then stuck a washi tape film strip piece over this. The flowers have also been brushed with a little brown ink to give them a more rustic appearance.